Update: The Motorheadphones have now been officialy launched in the UK and are due to hit the shops in mid November. There will be three pairs of over-ear headphones available: Bomber (£79.99), Ironfist (£99.99) and Motorizer (£129.99) plus two earphones: Trigger (£39.99) and Overkill (£49.99), and 3 smartphone cases: Burner (£29.99), Metropolis (£29.99) and Capricorn (£34.99). Swedish brand Krusell has teamed up with legendary rockers Mötorhead to produce a range of headphones with the unimprovable of Mötorheadphones. Unveiled at an IFA press conference by the band's drummer Mikkey Dee, the new range is made up of two pairs of headphones and six pairs of in-ears. 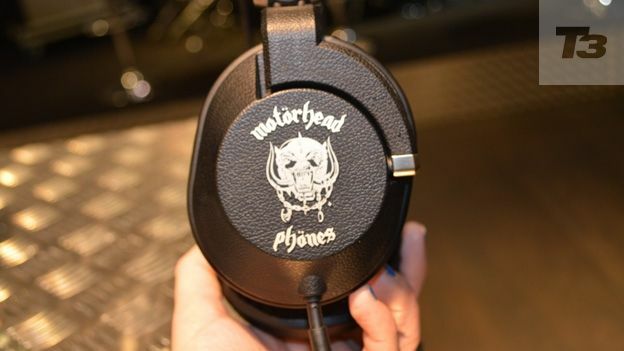 The flagship Iron Fist headphones feature an over-ear design along with the band's distinctive logo emblazoned on the earcups. According to Mötorhead's drummer - these headphones are "unbreakable" and that they would survive even if you were to "smack your producer" with them. We can't vouch for that but the headphones certainly did feel pretty robust, sporting an unusual rubber headband, with a gap in the middle. The cable is covered in woven fabric which means that it won't tangle: something Mikkey Dee was very pleased about at the press conference. The distinctive design of the headband means that the headphones don't sit heavily on the top of your bonce - a common problem for cans that are a little on the heavy side. The plush cushioning on the inside of the earcups is also pretty comfy, although we're not sure how they'd feel after a couple of hours' listening. These headphones are clearly aimed at rocks fans, rather than the dance music connoisseurs who tend to opt for the likes of the bass-heavy Beats by Dre cans. If was slightly difficult to give the cans a fair listen thanks to the Mötorhead soundtrack blaring out on the PA system, but from what we could tell, they sounded pretty good. Obviously that's something we'll look into as soon as we can get our grubby mitts on a review sample. The Mötorheadphones are a good alternative for the all the celeb headphones that are plastered with rap and R&B stars and at first glance, they're reassuringly robust with decent audio. And anything that Lemmy's had a hand in has to be cool, right? New headset has been designed to US military standards and is released alongside the Halo Fusion Wireless and tiny Jabra Eclipse. Can the Sennheiser IE 800 in-ear headphones justify the price £599 tag?